Entries on drugs, medical procedures, and therapies are based on the same format. Each begins with the definition, a statement of purpose or use, and a description. Drugs are identified by their chemical formulae and generic and brand names. Dosage information resembles that in the Physician's Desk Reference but is presented in lay language. Precautions, interactions, side effects, and risks are covered. Medical procedures (therapies and tests) are thoroughly outlined from start to finish, including preparation, risk, and aftercare. Both normal and abnormal results are identified. All types of entries conclude with lists of resources to consult. Usually these are books, periodicals, and organizations. Diagrams and photos from medical texts are peppered throughout the encyclopedia. Several full-skeleton body-system illustrations serve as additional identification aids. 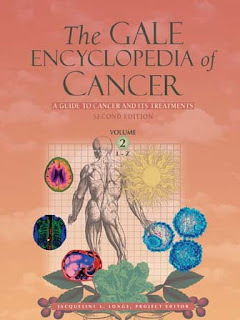 An encyclopedia of this caliber would not be complete without lists of support groups, government agencies, research centers, and comprehensive cancer centers. These appear in the appendixes. Three pages of contributors to this encyclopedia, with credentials and affiliations, precede the main text. This outstanding medical resource belongs in public, academic, and medical libraries accessible to patients and their families.